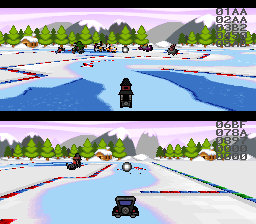 This is a prototype of the unreleased game, Wacky Races. 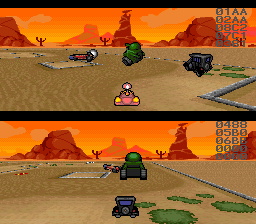 This is a very early mode-7 racer based on the Hanna-Barbera cartoon that aired in the late 1960s. 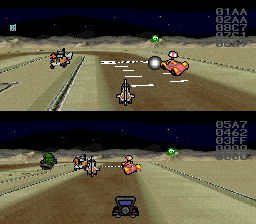 The game has a large variety of stages, but there is no collision detection, and the opponent racers are not programmed to stay on the track. 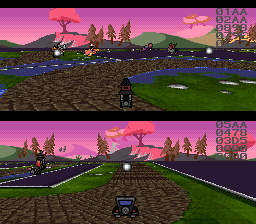 It looks like it would have been designed to be a Mario Kart clone, complete with weapons and stage hazards, but none of that has been included in this prototype. 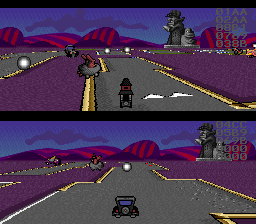 There is a near final prototype of the Genesis version of the game, which shares many of the same graphics, notably with the background and cars. 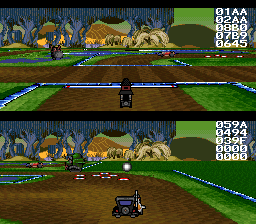 The layout of the stages is quite a bit more like Mario Kart in the SNES prototype. 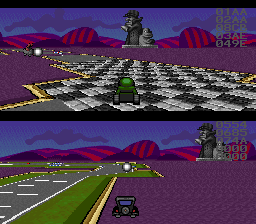 Of course, it is entirely possible that the final SNES version would have had the same design as the Genesis version if it was completed. 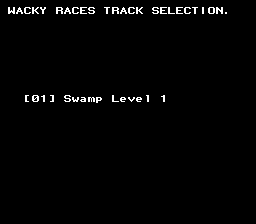 From the above linked Segaretro article, it sounds as though Virgin was unable to publish Wacky Races because they did not acquire the proper rights to the license. 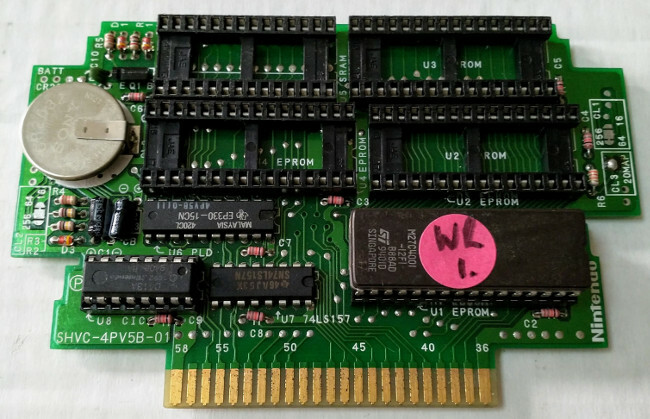 This prototype was saved along with a bunch of other prototypes for various systems when Virgin Games' office shut down. 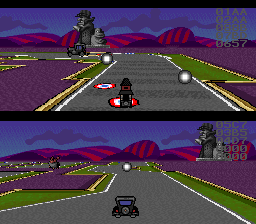 Radar had two prototypes of the game, but only one is playable as the other one only has one of the required chips. 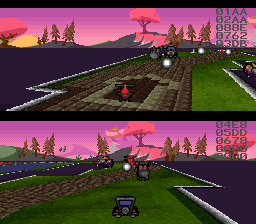 They are from different builds, but after looking at a tile viewer, they can't be too far apart in date. 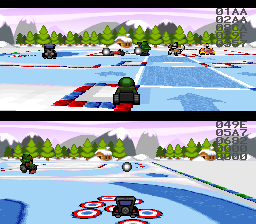 Note, if you want to play this game, you have to play it in PAL mode. 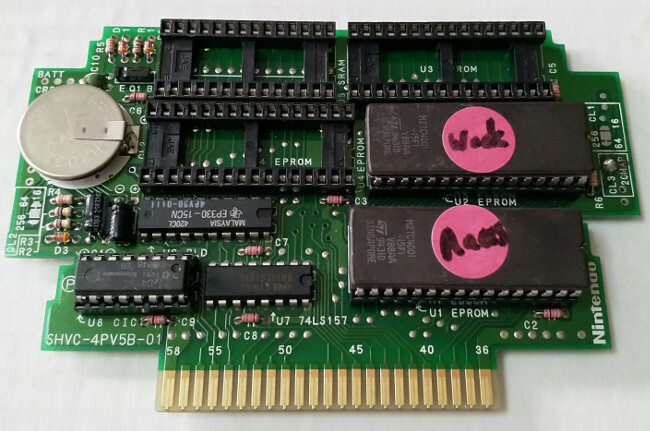 By default, most emulators detect it as NTSC, and it will cause glitches! 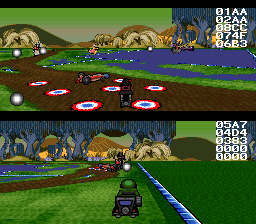 The level is stuck in a two-player split-screen mode, and both players are fully controllable. 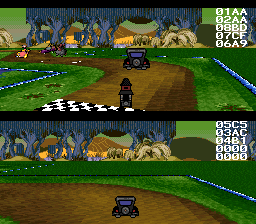 If you run out of bounds, the game will knock the first player back to the course, but the second player can drive out further. 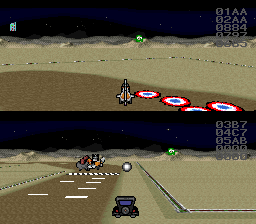 There is some debugging code in the right side of the screen.